Only one large, intensive design effort has been done on sailing ships to date. In 1976 and 1977, a square sailer and a heliogyro were designed for a rendezvous with Halley's comet. The square sailer had a single sail 820 m on each side. The heliogyro had nearly the same total sail area in its 12 blades. A simple chain of logic says that if an 820-m sailer can be built, so can one of 1000 m. In fact, the designers of the square sail said the same basic design could be extended to 2000 m. This range, 1 to 2 km, is important for moving people and cargo to other planets. These ships could help, and possibly enable, economical development of the solar system. A 1-km ship could have been built and put into operation during the 1980's, and could have been followed by a 2-km ship in the 1990's. Instead of sending one or two costly small spacecraft to Mars at each opportunity, these ships could be carrying tens of tons per trip. The whole economics of exploring and developing Mars could be changed through the use of these low-cost and economical ships. Ships that do not spin are said to be 3-axis stabilized, that is, they have means of controlling their orientation about 3 axes. These ships must use booms or other devices to hold the sails open. A variety of designs have been proposed, but the most structurally efficient are ships with 4 booms. Six boom configurations are also structurally efficient. Composite booms which can be coiled onto a drum for stowage and deployment. These have circular or lenticular cross sections. Open-truss booms which coil into a canister. These are triangular in cross section and can have about a 100:1 extension ratio. Inflatable booms which are very simple and of low mass. These need to have some means of becoming rigid without relying on gas pressure for long-term use. The square-sail design done at JPL in 1976 used open-truss booms and a mast. Numerous stays were used in the design to stabilize the structure while keeping the booms as light as possible. This was a complex, but efficient structure. The mass of the mast, booms, and stays was approximately 20% of the mass of the sail. The design is illustrated here. The design achieved a sail loading (areal density) of about 6.6 g/m2 excluding the payload. Sails can be spun to achieve their necessary rigidity through centrifugal action rather than relying on booms. The two basic types are a disk sailer using sail panels with non-parallel sides and the heliogyro, that uses sails as long, untapered blades. The disk sailer is expected to have the lowest mass of perhaps any sailing ship. If the sail can be made sufficiently thin, this type of sailer could possibly achieve an areal density of less than 1 g/m2. The heliogyro was found to require substantial edge tendons along the blades to withstand the centrifigual forces. The result was that the heliogyro is not as mass efficient as the square sailer, but it was favored because of its deployment simplicity compared to the square sailer. Triangular sails will have less of a wrinkling problem than a square sail. Being attached with three lines, they can be adjusted to provide full attitude control for the ship. Pressure on a sail induces curvature in it. The parameters of curvature are shown in the figure at right. 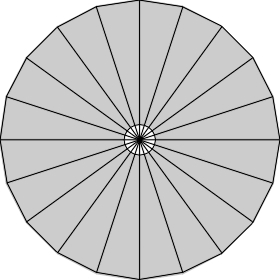 A representative degree of scallop is about 2% of the span of the edge. Determination of the curvature under actual sailing conditions requires a finite-element analysis of the sail loads, actual pressure, and structural deflections. This will allow determination of what built-in curvatures should be in a sail. The outer edges of a sail must be reinforced, especially near the attach points. Rip stops should also be used across the sail membrane. Production seams will usually provide rip-stop protection in one direction, so rip stops need be added only in the other direction.